Mini albums are all the rage at the moment. They are great for small projects and as gifts. There a lots of albums on the market to choose from, but today we look at creating one yourself. All you need is a few basic scrapbooking supplies and a little creativity. To create this mini album, you will need Purple Bazzil cardstock for the cover, Purple cardstock, White vellum, White brads, White ribbon and Karen Foster Sweet Impressions stickers. 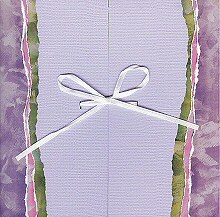 Begin by cutting a piece of purple Bazzil cardstock 6 inches by 12 inches. Place it textured side down on the table so the horizontal axis is the longest. Very faintly rule a line down the middle and fold each side into this line to create your two flaps. When you are done, erase the line. You have now created the cover of your album. The texture on the Bazzil paper should be on the outside and you should be able to open it from the middle. Cut one of your Karen Foster Sweet Impressions border stickers in half. Adhere one half to each side of the front cover (the straight edge will be along the fold line. Finally cut two small slits (one on each flap). These will be to thread your ribbon through when you are ready to close the album. Your cover is now complete and it's time to create the inside. 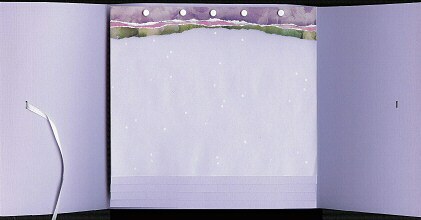 For the inside, I have layered several pieces of cardstock attached at the top to create a flip album. It is up to you how many layers you use. I chose to use four layers of purple cardstock and one layer of white vellum. Try to keep your album as thin and light-weight as possible. Keep in mind it is made of cardstock so will only handle so much weight and thickness. I would not recommend using more layers than I did. Begin by cutting your largest layer. Measure the width of your album between the two fold lines. Make your first layer about 1cm narrower. This will enable it to handle the weight better and will assist you when closing it. When determining the height of this layer, keep in mind that you will want to use the cover as your last page. Therefore, your height should be a little shorter than your album. Each subsequent layer should be the same width as the first layer. However, each layer should be a little shorter than the last to create the flip album effect. I recommend using vellum for the top layer. It softens the effect and allows you to write a message or quote introducing the album. Cut your remaining border sticker in two and stick one half across the top of your top layer. Attach your layers to your album with brads. I recommend using at least three brads (preferably five) to hold the layers in place. Now that you have made your album you can go ahead and decorate your pages with photos, pictures, quotes and anything else that takes your fancy. You also have lots of Karen Foster Sweet Impressions stickers left to decorate your pages and carry your theme. When you have finished decorating your pages, tie your ribbon through the slits on the front cover and tie your album closed. You now have a beautiful album to keep or give that someone special.